Martin I. Klauber, Scott M. Manetsch, ed. 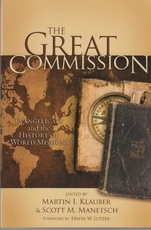 The Great Commission provides a substantial historical survey of evangelical missions from eleven different scholars, including prominent evangelical church historians and theologians, who have written extensively on the history of Christianity and the greater mission of the church. Thoroughly detailed here are the origins and development of modern evangelical missionary activity, events that led to the globalization of the Evangelical movement, and the finer points of the movement's successes, failures, and future imperatives.